The Weekly Wrap is an update each Friday morning from the Office of Strategic Communications. 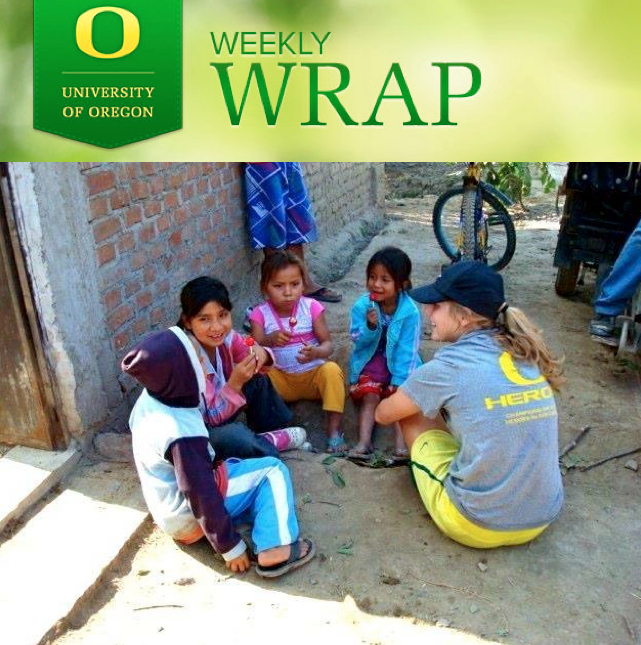 It provides highlights of news you may have missed during the week and showcases UO stories about amazing students, faculty, staff and alumni. Poynter: UO’s annual iPad-only student magazine successfully challenges students to be innovative. Daily Emerald: Award-winning and best-selling comic book author Brian Michael Bendis is one of UO’s newest professors, serving as an instructor for the comic book and cartoon studies major. AroundtheO: The University of Oregon and Lane Community College are working together to pilot a new internship program that will place LCC students looking for on-the-job technical training at the UO. Science Codex: Researchers at UO reveal that the diversity of flower colors among species is often controlled by a predictable set of genes, suggesting that evolution may be repeatable. AroundtheO: The Bicycle Transportation Alliance has initiated their challenge once again: bike to work every day for a month. The competition began on Sept 1 and will continue through the end of the month. Celebrating Champions: This summer, 20 members of the O Heroes program — student-athletes who provide service to the community — traveled to Peru to build a sports court.